MOST IMPORTANT MEAL OF THE DAY, BREAKFAST IS. Who isn't a fan of Big G cereals? Who isn't a fan of Star Wars? If you're reading this article I'm 100% sure you're a fan of both! Our friends at Big G and Star Wars have teamed up to bring fans what they love, from favorite cereals to the prizes inside and everything in between. 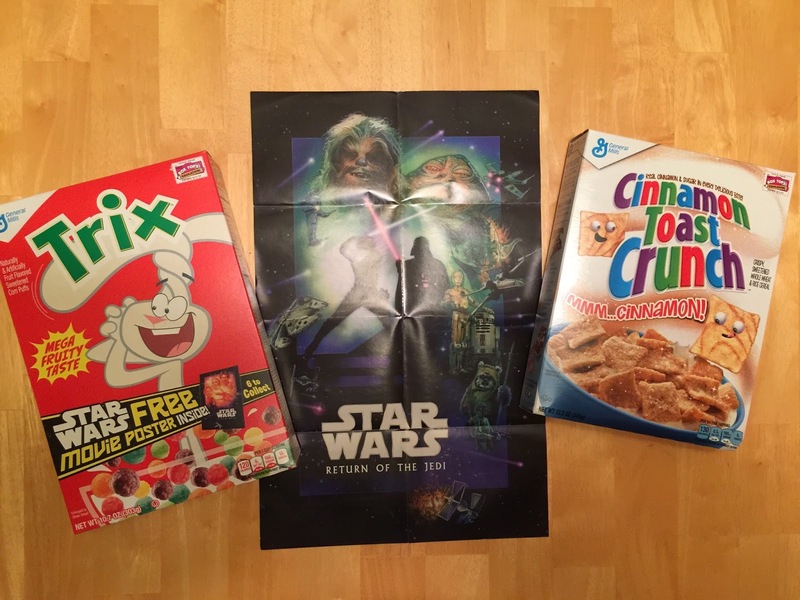 Use The Force and find specially marked boxes of Big G cereals for exclusive vintage Star Wars movie posters like the one I have below! Our cat Edgar getting in on the fun! Silly Rabbit! TRIX are for cats! LOL! Star Wars and cereal fans alike can collect all six classic posters in each participating brand of General Mills cereals, including Cinnamon Toast Crunch, Honey Nut Cheerios, Trix, Cookie Crisp and Reese’s Puffs. The specially marked boxes of Big G cereals are around for a limited time only. Who needs luck when you have The Force to help you find these FREE posters! Happy hunting and may The Force be with you, always! *Thanks to Big G for sending JediMouseketeer.com the tasty cereals. Edgar says thanks too!